Varying sizes and shapes of split kelp. Note the deep splits in the individuals at bottom left, as well as the bullate texture of all specimens. Note the flattened stipe near the base of the blade; the stipe widens to become cylindrical near the holdfast. Photos by Jenn Burt. 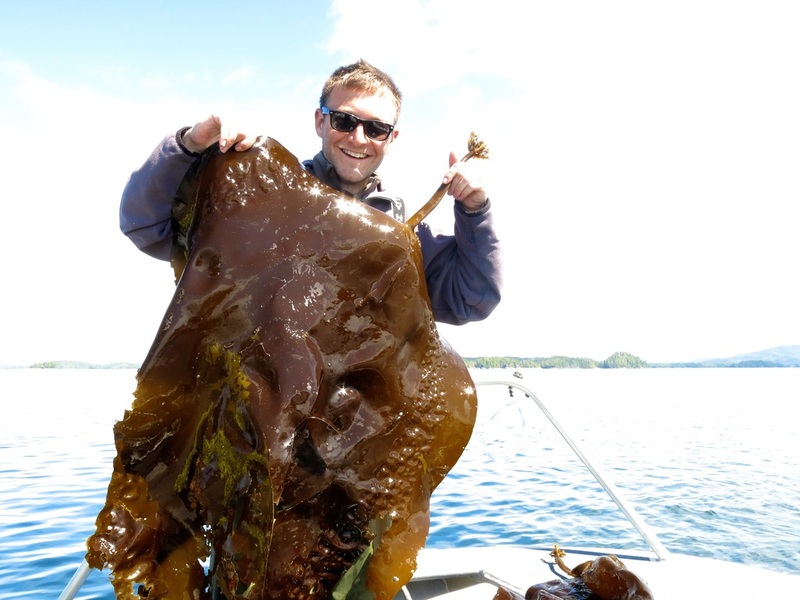 This perennial brown seaweed has a single blade that can be up to 2 m long, attached to a stipe to 60 cm long. The blade may be puckered (bullate), particularly in younger specimens, and tends to become smoother and thicker with age. The blade, which lacks a midrib, is often split once or twice along its length, dividing it into segments. The stipe is flattened where it attaches to the rounded or heart-shaped base of the blade, before expanding out into a cylindrical shape towards the holdfast. The holdfast can be relatively small but is highly branched. 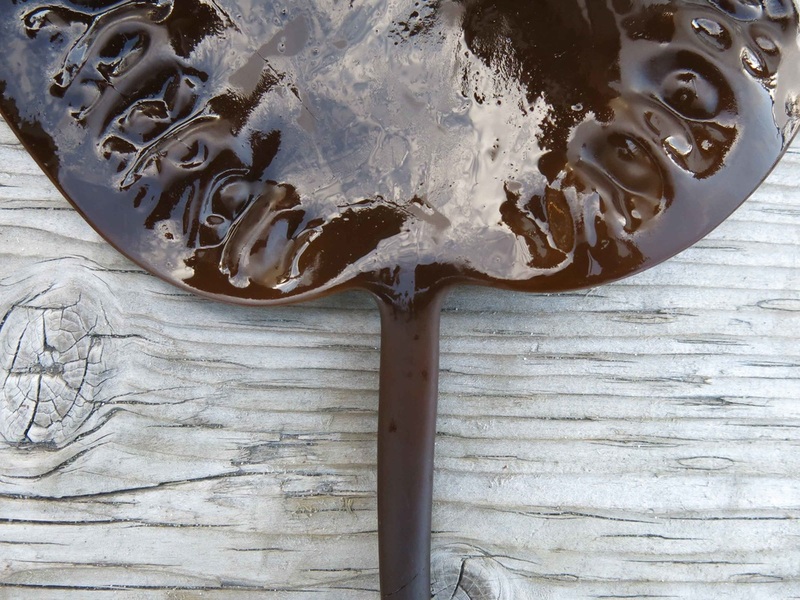 Split kelp is dark to medium brown. Split kelp attaches to rock in the low intertidal and shallow subtidal, in semi-exposed to semi-protected locations. Its range extends from the Bering Sea and the Aleutian Islands to central California. It also extends west from the Bering Sea to Kamchatka and the Kurile Islands in Russia. 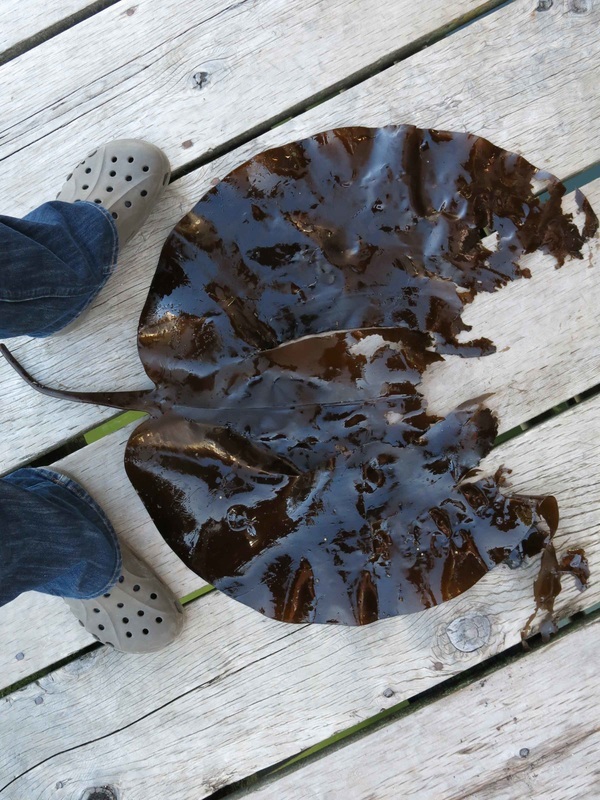 Sugar kelp (Saccharina latissima) has an undivided blade that may be tattered at the tip, and often bears rows of bullations (puckers or swellings) near the blade base. The blade tends to be thinner and lighter in colour (light to medium brown), and can grow longer (to 3.5 m). The cylindrical stipe does not flatten towards the base of the blade, as it does with the split kelp. Despite these differences, the most definitive way to distinguish the two species is by the presence or absence of relatively large (but still microscopic) empty intercellular spaces called mucilage ducts inside the stipe: these ducts are present in split kelp (starting in the second year of growth) but not sugar kelp. 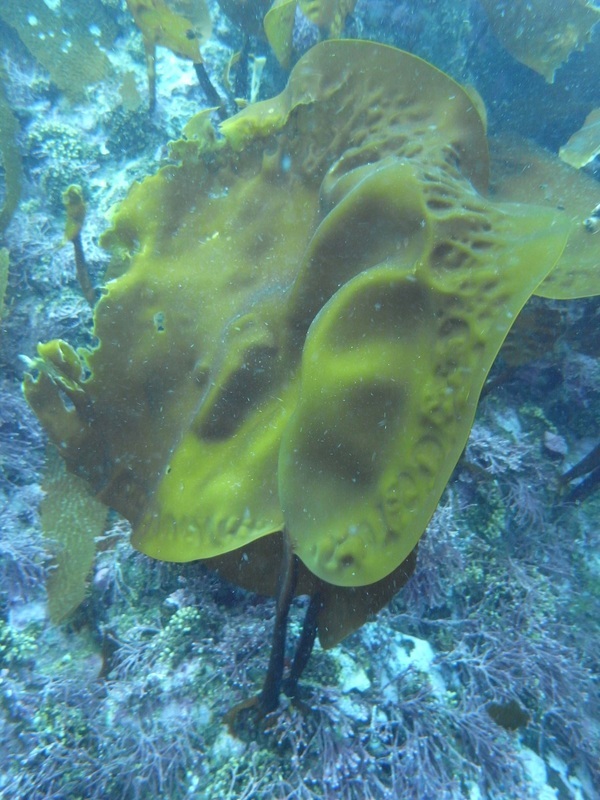 Suction-cup kelp (Laminaria yezoensis) also has split blades, but has a distinctive suction cup-like holdfast. 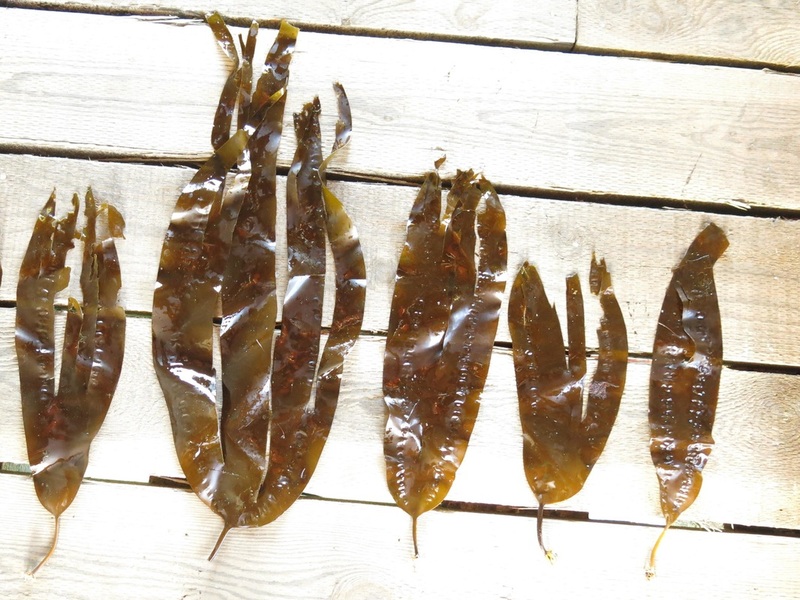 Split kelp may appear similar to other Saccharina and Laminaria species at various growth stages, particularly split kelp specimens that lack the distinctive split blade. Lindberg, M. and Lindstrom, S. (2010). Saccharina groenlandica Split Kelp. Seaweeds of Alaska. Accessed 09/02/2015. O'Clair, R. and Lindstrom, S. Saccharina groenlandica (Rosenvinge) C.E. Lane, C. Mayes, Druehl & G.W. Saunders. In Klinkenberg, Brian. (Ed.). E-Flora BC: Electronic Atlas of the Plants of British Columbia. Lab for Advanced Spatial Analysis, Department of Geography, University of British Columbia, Vancouver. Accessed 09/02/2015.